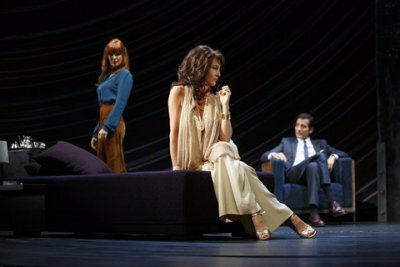 Like Mike Nichols’ 2013 production of Harold Pinter’s Betrayal with film stars Daniel Craig and Rachel Weisz, Douglas Hodge directing the Roundabout Theatre Company revival of Pinter’s 1971 Old Times doesn’t trust the material – or his audience. He has gussied up this minimalist, spare drama with a huge set by Christine Jones which overpowers and distracts from the play. The loud, booming music by Radiohead’s Tim Yorke gives an entirely wrong introduction for the play about to be seen. 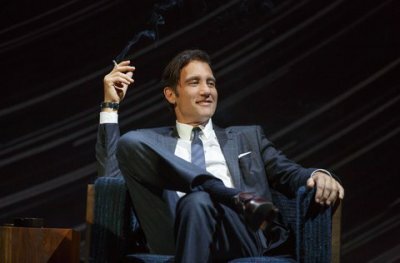 The production includes the Broadway debuts of British screen and television stars Clive Owen and Kelly Reilly, and a return of British stage star Eve Best after her Tony Award nominated performance in the 2008 revival of Pinter’s The Homecoming. Unfortunately, to some extent they are appearing in three different plays so different are their acting styles. Even Constance Hoffman’s costumes take your mind away from the play before you. A pity actually as Old Times has not been seen in New York since the Roundabout’s Off Broadway revival which ran from 1983-84 but had an odd combination of American and British actors of film and stage. A study in memory and desire, Old Times portrays a power play between a woman, her husband of 20 years and her best female friend she has not seen in all this time. Set in a converted farmhouse near the sea, this Pinter play has Deeley, a filmmaker, and his wife Kate awaiting her former roommate Anna who is visiting from Italy where she lives with her wealthy husband. Deeley claims to have never met Anna but she informs him that she was her roommate in London two decades before which comes as a surprise to him. When Kate arrives, she reminisces about her time with Anna in London. She and Deeley tell stories of their days in London which don’t jive: he claims to have met Anna at a showing of the movie Odd Man Out (ironic choice) while Kate claims to have attended the movie with Anna. Deeley remembers Kate from a tavern called the Wayfarers that she claims to never have visited. Kate describes a party at which a man looked up her dress, while Deeley describes a similar party that he claims he took Kate to on their one date. Anna says little, but at times she and Kate relive scenes from their past, either as flashbacks or as a game they play which leaves Deeley out. At one point Anna and Deeley compete for Kate’s attention by singing snatches of old songs such as “They Can’t Take That Away From Me,” “The Way You Look Tonight,” “Lovely to Look At,” “I Get A Kick Out of You” and “Smoke Gets in Your Eyes,” which in this context become charged with hidden meaning. In the course of this cat and mouse game, it becomes obvious that Anna had a strong attraction to Kate but we are never told if it was reciprocated. Deeley baits Anna and flirts with her but she fights back with her former connection to Kate. However, both women reveal that Anna borrowed Kate’s underwear for various social occasions. Additionally, Kate and Anna tell stories of a man (Deeley?) visiting Kate but both versions are different. At one point, Anna says about memory, “There are some things one remembers even though they may never have happened. There are things I remember which may never have happened but as I recall them so they take place.” Very near the end of the play she says, “I would like you to understand that I came here not to disrupt but to celebrate.” In the most controversial speech in the play, Kate looking at Anna says “I remember you dead,” which has been interpreted in various ways. As in Nichols’ revival of Pinter’s Betrayal, the subtext is made explicit leaving little hint of ambiguity, or the sense that memory plays tricks on the mind. And along with the direction, the set leaves little to the imagination, aside from two divans (which could be beds) separated by an armchair. The stage on which this takes place is encircled by a huge two-story cyclorama with concentric circles surrounding what might be the sun. At times the circles noticeably change color. The play is performed on a revolving stage which slowly moves to the audience’s right. Once you notice it, it is difficult not to watch it. Then at a certain point in the second scene, it begins to rotate back to where it was before. Slightly off-center in the back stage left is a slab of ice used here as door to a bathroom, with no explanation for this choice of materials. Off to the sides are jagged black rocks that set the play in a kind of volcanic wasteland. This short two-act play is performed straight through with no intermission, giving the audience no time to ponder the events until it is over. All three stars are currently best known in America for their television work: Owen as Dr. John W. Thackery in The Knick (now in its second season), Best for Dr. Eleanor O’Hara in her three seasons on Nurse Jackie, and Reilly as Jordan Semyon in the 2015 True Detective. Best dominates the play, partly because Anna does the most talking. Continually circling around Kate, she suggests a panther stalking its prey. She also plays Anna as affected, sophisticated and worldly which is different from the other actors. Reilly, who says little, reclines on her divan like a feline presence all curled up and basking in the attention. With her auburn mane and tight fitting two-piece outfit, she brings great sensuality to Kate but remains an enigma as she is probably intended to. Owen has the slightest role as the husband who is literally “odd man out” in the relationship between the two women. He resembles a lion or tiger periodically defending his domain. Offering accomplished stage presence as he smokes in his armchair initially center stage and occasionally rising to murderous heights, he comes in a close third. Constance Hoffman’s costumes for her cast seem to put the actors in three different plays while not suggesting any particular period, while Japhy Weideman’s lighting unaccountably includes flashing lights aside from the illumination needed to highlight the set and the actors. Yorke’s original music attempts to make the 44 year old play hip but only succeeds in making it appear that it has wandered in from some other theatrical event altogether. The plays of Harold Pinter are all about menace and mystery. The Roundabout Theatre Company revival of Old Times brings three fine British actors to the New York stage. Unfortunately, director Douglas Hodge, best known in New York for his flamboyant Tony Award-winning performance as Albin in the 2010 revival of La Cage aux Folles but a famed interpreter of Pinter in London, has made this revival provocative for all the wrong reasons. Elizabeth McGovern returns to Broadway after 25 years in Priestley play about a wealthy British family that lives in the country and falls on hard times. Exciting and vigorous shortened version of Shakespeare tragedy is accessible for all. Great introduction to the play for those unfamiliar with it.